Bob Hope was here for a good time and a long time, passing away at 100 years of age in 2003. In his roughly 80 odd years of performing he knew the importance of making a living, a very good living. He lent his name and image out thousands of times over his career for everything from cigarettes to tooth paste and then some. 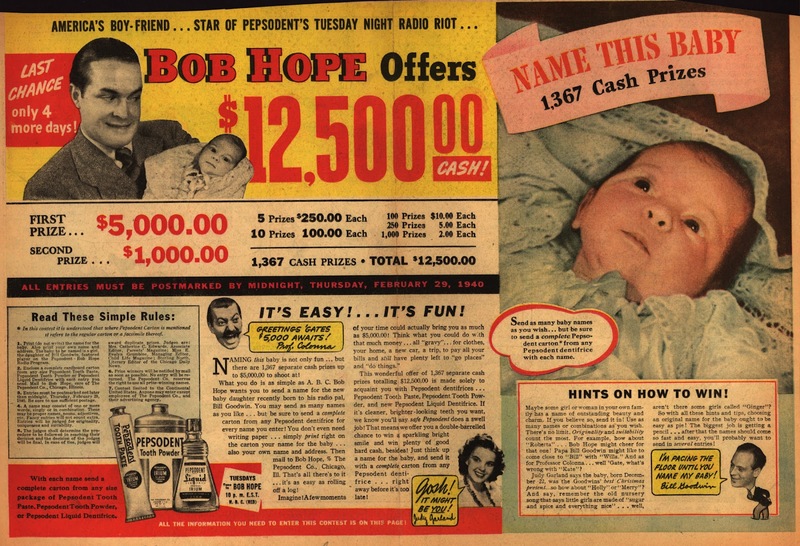 On today's Creative Excellence Friday blog, a look back at the advertising career of Bob Hope. Up first, a magazine ad from the forties for Pepsodent. 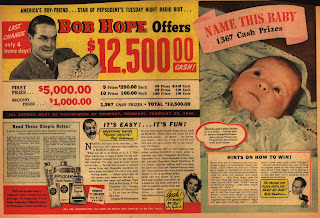 The Name this Baby contest. The techniques used aren't that different from a fan building promotion for Facebook today. Every entry must be accompanied by a Pepsodent box liner. When you talked about winning 12,500 dollars in 1940, people took notice. Although the artist who drew Bob Hope wasn't very flattering. You would think he would have left out a wrinkle or sag in defence of the anti-aging properties or healthy skin agents from the sponsor, Swan soap. And honestly I'm not sure either drawing actually looks like its' intended "victim". In the 70's Bob aligned himself closely with Texaco Oil. He did a number of commercials for them over the years and they sponsored various prime time specials he starred in for NBC. As you watch this you'll get a good idea of how we've become accustomed to the 30 second commercial. This almost seems like a mini documentary as a 60. Speaking of time honoured 70s commercials, remember the John Cameron Swayzee commercials for Timex? "Takes a licking and keeps on ticking." Guess who was a celebrity spokesperson long before that? 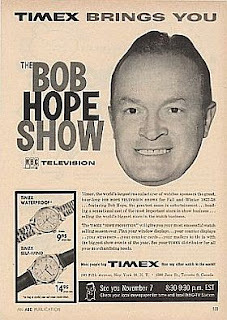 Bob Hope. The legend on television and in the world of the commercial. That's it for this week. Have a great weekend. Keep the comments and suggestions coming. Thanks for reading and watching.